Higanbana no Saku Yoru ni (彼岸花の咲く夜に?, lit. On the Night the Red Spider Lily Blooms), subtitled The Unforgiving Flowers Blossom in the Dead of Night, is a Japanese horror manga written by Ryukishi07 and illustrated by Ichirō Tsunohazu. The manga debuted May 2010 and was later adapted into a visual novel released August 13, 2011. Marie is the main protagonist of the first story, "Mesomeso-san", and is a recurring character thereafter. She is introduced as a student who is bullied by her classmates and molested by her homeroom teacher. While despairing over her predicament in the bathroom of an abandoned school building, she becomes the subject of an urban legend involving a youkai named Mesomeso (derived from the Japanese onomatopoeia for weeping and sobbing) that haunts the bathroom. The school's youkai offer her the chance to become a youkai herself in order to fill a new rank in their hierarchy, which she does after being strangled to death by her teacher. As Mesomeso, she appears before the series's other protagonists to support them if they are victims of bullying, or to confront them if they are bullies themselves. Higanbana is the third-highest ranking youkai in the school, also known as the "Dancing Higanbana". 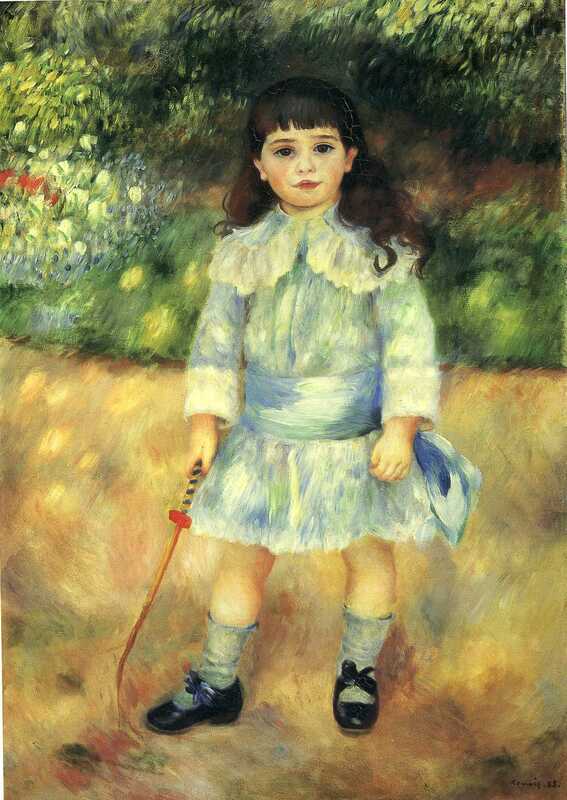 She is a girl who takes the form of a Western doll that sits in the school infirmary which, according to her associated legend, dances on its own at night. She is the youkai who directly offers Marie the chance to become Mesomeso and later treats Marie as her personal assistant. She regularly torments cruel or weak-willed students, and is depicted as either an antagonist or an antihero depending on the story. Higanbana no Saku Yoru ni takes place in an unnamed school setting and is composed of numerous self-contained short stories, each told from the perspective of a student or staff member from the school. These stories feature bullying as a major overlying theme, as each story's protagonist is depicted as being either a victim of bullying or a bully themselves. Higanbana revolves around a series of urban legends caused by supernatural beings called yōkai, each of which claims ownership of a particular "mystery" and kills anyone who tries to investigate it. There are a total of seven "mysteries" at the start of the series, with numerous yōkai fighting each other in an ongoing turf war for ownership of these mysteries, which is granted to the seven yōkai who emerge victorious in the conflict. The stories' protagonists interact with at least one of the school's resident yōkai, who force the protagonists to deal with the consequences of their actions regarding bullying. The two arcs, Dai-ichi Ya and Dai-ni Ya, each contain seven stories. Most of the stories are self-contained however a few stories either have references to or are sequels to other stories. Marie Moriya, a submissive and often-bullied student, falls under the protection of her teacher, Yoshihito Kanamori, who uses his status to exploit Moriya. Kanamori frequently uses Moriya to fulfill sexual desires by taking advantage of Moriya's inability to say "no" to others. As their relationship comes to an end, Moriya learns that her habit of crying in the school bathroom has become associated with the legend of a youkai; Mesomeso. She encounters a youkai known as Higanbana and desires to become a youkai herself through death. Moriya briefly considers suicide before eventually being murdered by Kanamori. As Kanamori kills Moriya, he himself claims the title of Mesomeso, throwing the title into contention. Later, Kanamori confronts the spirit of Moriya in the same bathroom he killed her in, which disqualifies him from being Mesomeso. As a result, the legend of Mesomeso comes true and Kanamori is torn apart by having every bone in his body broken. Moriya then ascends to become a youkai known as Mesomeso. As a young student, Takeshi Nonomiya is falsely accused of breaking a human anatomy dummy, leading him to become obsessed with the ability to prove the truth, leading to an interest in photography. One day, Takeshi finds an old instant film camera in the Newspaper Club Room. Takeshi uses the camera to take a class picture with all of his classmates. The class picture takes significantly longer to develop than other pictures Takeshi had taken with the camera. After the photo develops, Takeshi sees a girl in the photo that he doesn't recognize. The youkai Higanbana appears before Takeshi and leads him to the truth that the girl he cannot remember is Marie Moriya, a frequently bullied girl who recently died. All memory of Marie seems to have disappeared as Takeshi couldn't find Marie's picture in a field trip guidebook and doesn't remember her being in his class. Takeshi learns that showing the class picture with Marie in it causes people to remember her when he tracks down Marie's mother, who also had forgotten Marie existed. On his way home, Takeshi is caught up in a battle between Higanbana and a youkai known as the Headmaster, who is responsible for erasing Marie Moriya from existence. With Higanbana's help, Takeshi escapes back to his house. Higanbana asks Takeshi to show her his photo albums, which Takeshi begrudgingly obliges to. Higanbana reveals to Takeshi that a series of blurred photos that Takeshi never thought much of are a result of the Headmaster erasing someone from existence; specifically the very person who had falsely accused Takeshi in the past. Takeshi painfully remembers that he had begun to stalk the girl who accused him in an attempt to catch her doing something wrong and passing the blame off as she had done to him. However, the girl became aware of his stalking and began to break down, eventually leading to her suicide. Higanbana brings that girl, Yoko Numata, back to the human world and offers her a chance to kill Takeshi in revenge. However, Yoko and Takeshi instead make amends for their pasts, allowing Takeshi to live on and for Yoko to be redeemed from the hell she had been existing in. "Princess" Midori Kusunoki, a wealthy and popular girl, pursues the lead role of "witch" in the school play "Rokkenjima". Midori had previously been the victim of severe bullying until she made a deal with a youkai known as a the Black Tea Gentleman, in which she would receive whatever acting part she desired in exchange for a part of her soul. Midori opted for the lead role of "princess" in a school play, which she excelled at, thus garnering popularity among her classmates. The only classmate who didn't like Midori was a girl named Nozomi Kawada, another wealthy girl who had previously been known as the "princess" of the class. When Midori took the title of "princess", Nozomi became the victim of intense bullying from her classmates. Later on, Midori begins to experience random sharp pains while practicing for her role as "witch", Midori comes to believe that it is the work of a curse Nozomi had placed on her. When she asks the Black Tea Gentleman about her pains, he simply says to ignore them. Another youkai, Marie Moriya, believes that the Black Tea Gentleman himself was inflicting the pains on Midori and attempts to free Midori from his influence. She briefly succeeds and Midori, now free from the Black Tea Gentleman, realizes a painful truth: the role she opted for when she made the deal with the Black Tea Gentleman was not the role of "princess" in a play but the role of "Nozomi Kawada" in real life. In actuality, Nozomi was the popular star of the school play while Midori was a hateful victim of bullying. The Black Tea Gentleman regains influence over Midori and reveals that his abilities allow humans to believe lies. Under his influence, Midori believes the lie that she is the popular "princess" instead of Nozomi and fails to realize that the random pains she experiences are from her classmates hitting her and bullying her. One day, Michiru Sakurada, an unpopular girl with a "sixth sense" allowing her to perceive the spirit world, feels a strong burst of emotion emanating from a shrine behind the school. Michiru deduces that the emotion she felt was due to the fact that a group of girls had broken the shrine's doors with a ball. Shortly after, one of the girls who broke the shrine is hit by a falling chair. Michiru warns that the guardian deity of the shrine was angered and had placed a curse on the girls who broke the shrine. Michiru insists that the curse can be lifted if the girls apologize to the deity though the leader of the group, Hiromi, refuses to do this. A youkai, Marie Moriya, helps the girls convince Hiromi to apologize to the deity. However, Marie learns that the guardian deity of the shrine, Sakunoshin, is a meek animal spirit that has nothing to do with the supposed curse afflicting the girls. It is revealed that Michiru herself was responsible for injuring one of the girls with a falling chair and endeavored to hit Hiromi with a fire extinguisher before being stopped by Marie. Michiru explains her frustration with how no one would listen to her when warned her classmates about the supernatural. After she felt the burst of emotion from the shrine, Michiru expected a curse to befall the girls who broke the shrine and was disappointed to see that nothing happened to them. Thus, Michiru started her own "curse" in an attempt to validate her warnings of the supernatural. Marie convinces Michiru to give up her "curse" and instead visit the guardian deity herself. The school nurse had recently repaired the shrine door and Michiru will be able to feel Sakunoshin's joy at his repaired home. Hikaru Nihei, an intelligent boy and member of the animal raising committee, is often bullied by way of taunts and having his notes thrown into the trash. To escape his bullying, Hikaru takes refuge in the rabbit cages which are fairly isolated from the rest of the school. While in the cages, Hikaru injures and abuses the rabbits to vent his frustrations. While abusing the rabbits, Hikaru is interrupted by Hameln, a relatively new youkai who is unranked in regards to other school youkai. Hameln tells Hikaru of his abilities: when inside the music room, Hameln can play his castanets to turn anyone into a small animal. Hameln offers Hikaru his powers and Hikaru uses them to turn four of his bullies into rabbits. He takes the rabbit-bullies into the rabbit cages and kills them in cruel ways. The next day, the gruesome scene of murdered rabbits combined with the news that four students never made it home have caused a stir within the school. Higanbana confronts Hikaru and tells him that he doesn't understand what it really means to kill. She drags Hikaru into his own memories and it is revealed that Hikaru himself had bullied a girl named Yuuko Kinoshita by throwing her notes away and noticeably looked down on his classmates. Higanbana recreates Hikaru's murders from the previous night but has the rabbits take their original form as humans. Hikaru is forced to kill his classmates in the same way that he killed the rabbits in order to properly understand what he did. When Higanbana and Hikaru return to the present, Hameln attacks Higanbana and turns her into a rabbit. However, before he can kill her, Higanbana leaps into Hameln's mouth and rips out his tongue and several of his organs, killing him. Higanbana regains her youkai form and takes Hameln's castanets. She uses them to turn Hikaru into a rabbit and places rabbit-Hikaru into a cage with the remaining rabbits. The remaining rabbits assault Hikaru as Higanbana leaves. "One Girl's Day" serves as a type of epilogue to the earlier story "The Spirit Camera." The story follows an unnamed girl who goes about her day with a positive attitude. In order to test her, Higanbana plays a number of tricks on her in an attempt to dampen the girl's spirits, including tripping her and taking her homework. Despite Higanbana's constant antagonizing, the girl maintains a positive outlook, even when she is briefly sent to the infirmary for injuring herself. After leaving the infirmary, the girl finishes her school duties by cleaning out the science room. While cleaning the room and playing with her friends, the girl knocks over the anatomy dummy, breaking it. Another classmate, Takeshi Nonomiya, was meant to clean the science room and, in order to avoid him taking the blame, the girl takes responsibility for her actions. The girl, now revealed to be Yoko Numata, heads to the rooftop to meet with Higanbana and Marie Moriya. Yoko, having eliminated any regrets she once had about her life, is ready for her soul to move on. As per their agreement, Yoko offers her soul to Higanbana, who begins to consume it as Marie voices her disapproval. As Marie leaves, Higanbana releases Yoko's soul and allows it to float to heaven before following Marie. Yukari Sakaki becomes the object of intense bullying from her classmates, resulting from a brief period of time when she wore dirty clothes to school. Despite the bullying, Yukari maintained that she must never show any response to the bullies or else the bullying will get worse. Higanbana begins to tempt Yukari into committing suicide to escape her bullies, however Marie Moriya intervenes and protests that death isn't the answer to her problems. In an attempt to save Yukari from her bullies, Marie lures the lead bully, Ozaki, to the old school bathrooms. She invokes the legend of Mesomeso and uses her frightening youkai form to scare Ozaki out of bullying Yukari in the future. Ozaki agrees to never bully Yukari again before running away. However, Ozaki's lack of bullying doesn't deter other bullies from antagonizing Yukari, thus rendering Marie's plan pointless. To Marie's surprise, a transfer student known as Reiko Osumi joins Yukari's class. Reiko is even weaker than Yukari and appears to incite bullying from the class that exceeds what Yukari was subjected to. Thus, Yukari is left alone as the entire class, including the teacher, begins to bully Reiko. Despite being left alone, Yukari becomes frustrated with the bullying and tells Reiko that she wants to fight the bullying together. To Yukari's horror, Reiko reveals herself to be the youkai known as Sumire, a fearsome youkai whose tears cause nearby humans to become addicted to bullying others. Marie attempts to save Yukari from Sumire but soon realizes that she cannot defeat Sumire despite being more powerful than her; if Marie were to get rid of Sumire then Yukari would once again become the object of the class bullies. Sumire takes advantage of Marie's inability to take action and quickly defeats her. Afterwards, Sumire decides to eliminate the character of "Reiko Osumi" anyway and watch how Yukari handles being bullied again. The next day, the class gangs up on Yukari and begins to strip her of her clothes. Yukari manages to escape but Higanbana trips her and Yukari falls down a flight of stairs. For the next several days, Yukari is absent from school, which causes her classmates to become restless as they have no one to bully. When the school trip comes around, Yukari is still absent. While the class is on a bus, Higanbana appears in the middle of the road, causing the driver to swerve and drive through a guardrail and into a forest below. The crash kills the entire class, thus destroying all of the humans infected with Sumire's tears. Soon after, Yukari is transferred to a new class where she knows no one. She vows to stop any and all bullying wherever she sees it from that point on. On the night of a full moon, the school youkai come together on the school rooftop for a banquet. Marie Moriya attempts to change her clothes using spirit energy before attending the banquet, which causes her to be late. Once she arrives, Marie is introduced to the school youkai she hadn't met previously: Izanami, Azami, Renoir, and Kyou. The youkai spend the night drinking and Marie, having not been drunk before, eventually passes out. When she wakes, Higanbana chastises her for missing the banquet, confusing Marie. Marie's account of events varies greatly from Higanbana's: According to Higanbana, Marie never attended the banquet as the banquet was on the new school roof. According to Marie, the banquet was on the old school roof and she had drank alongside all the other youkai for the duration of the night. Aya Souma firmly believes that little in her life matters. She barely eats and has difficulty sleeping, though she isn't bothered by this as she sees death as a preferably alternative to continuing her life. One day, Aya overhears the legend of the 13th step: If one goes up the twelve-step stairway in school and manages to count a thirteenth step, then they will be cursed. Out of curiosity, Aya begins to count the steps every time she uses the school stairway. Eventually, Aya counts a thirteenth step, though she chalks this up to her miscounting. That night, however, Aya has a horrible dream wherein she watches a panicked student get caught by the youkai Izanami. The student is then thrown into a hell reminiscent of a digestive system and is made to be tortured within that hell for eternity. The following day, as soon as school ends, Aya notices that every student has suddenly vanished. Izanami appears and reveals that she is caught within his own world, wherein Aya cannot escape the school and there is no one around other than Aya and Izanami. Izanami lays out the rules of a game to Aya: Aya is to run away from him until the clock hits 12:00. If Izanami catches Aya then he will kill her. However, Izanami cannot run to catch Aya, he can only walk briskly. Aya manages to survive her first night with Izanami though she learns, to her horror, that she would have to repeat the process the next day. Furthermore, the time that she had to run had been slightly extended. In an attempt to escape Izanami's daily games, Aya seeks the help of Michiru Sakurada, a girl said to have a "sixth sense" with knowledge of the supernatural. Michiru reveals that the only way to escape Izanami's curse is to survive the games for 49 days. Seeing as the time she had to run increased with every passing day, Aya begins to believe escaping Izanami is futile. Soon after, Aya meets a boy named Osato, who is also caught in Izanami's curse. By sharing information with Osato, Aya learns that the time she spends in Izanami's world is dependent on how much she runs in the real world: the more Aya runs over the course of the day prior to entering Izanami's world, the less she would have to run to escape Izanami. Thus, Aya dedicates herself to running whenever possible in order to keep her time in Izanami's world as short as possible. After around a month of surviving, Izanami offers to make a deal with Aya: He will kill her and give her the peaceful death she originally longed for instead of sending her to hell. He offers this because Izanami has less time to hunt others as long as Aya keeps surviving and, seeing as Aya had considerable willpower from her daily runs, Aya's soul had grown distasteful. Aya rejects this offer and continues to survive until the 49th day. On the last day, Izanami appears at the school marathon. Unlike previously, Izanami will now run to chase Aya, though rather than running in Izanami's world, Aya just has to win the marathon to escape Izanami. With Izanami's motivation, Aya manages to complete the marathon before anyone else and thus completely escapes Izanami trap. Izanami conveys that he is proud to see how much Aya has grown and relinquishes her from his curse. Aya comes to the conclusion that "not wanting to die" is reason enough to live. Marie Moriya is approached by Kyou, the youkai of mirrors. Kyou is impressed with Marie's technique for cleaning mirrors and is thankful that Marie cleans the mirror in the bathroom she lives in as it saves Kyou from having to do it. Kyou tells Marie about a "mirror world" that exists beyond a large mirror outside the staff room. The mirrors in the mirror world have become dirty, presumable because mirror world-Kyou is slacking on his mirror cleaning duties. Thus Kyou asks that Marie help him clean all the mirrors in the mirror world. Marie agrees and enters the mirror world. While there, Marie encounters several characters from previous stories, though their personalities are markedly different; Mirror world-Headmaster is weak and passive, mirror world-Michiru Sakurada is a staunch believer in science and thoroughly rejects the supernatural, mirror world-Sakunoshin is a drunken bully, mirror world-Sumire and mirror world-Higanbana are submissive and fight each other over who gets to carry Marie's bucket of cleaning supplies. After these encounters, Marie wonders where her own mirror world counterpart is. Unfortunately, mirror world-Marie had actually orchestrated this entire event by tying up mirror world-Kyou in order to trick the normal Kyou into entering the mirror world. Mirror world-Marie, known as Geragera Marie, enters the normal world and attempts to take it over. Higanbana attempts to fight her but is quickly defeated, learning that Geragera Marie is the First Ranked youkai of her world and is thus much stronger than Higanbana is. Before she can do much more, however, Geragera Marie is pulled back into the mirror world by Kyou and his mirror world counterpart. As the normal Marie returns to the normal world, Higanbana begins to grovel at her feet as she mistakes normal Marie for Geragera Marie. Yuuki Noda is mysteriously killed in the art room by having a plaster bust fall on him, crushing him. Rumors begin to circulate among the school community that Yuuki was killed by a youkai who lives in the art room and kills you by placing you into a painting if you lie to him. A month later, a teacher named Nafumi Shintani bemoans Yuuki's death as she had accidentally killed him by pushing him while they were in the art room. Yuuki had been the model for several drawings Shintani had done. While in the art room, an unnamed young boy approaches Shintani and asks about Yuuki's death. While talking to the boy, Shintani makes tea for the two of them. After drinking the tea, the boy passes out. Shintani approaches the passed out boy and begins to strip him naked. Before she can finish, however, a mysterious girl interrupts her. The girl presses Shintani about Yuuki's death, implying that Shintani had been abusing Yuuki before she killed him. Shintani refuses to admit to any wrongdoing and eventually realizes that the girl she is talking to is the youkai Renoir. Shintani and Renoir battle over who has domain of the art room and Renoir is eventually defeated and seemingly shatters. However, the being that lost to Shintani was actually Higanbana in disguise. The real Renoir is the boy that Shintani attempted to strip. Renoir reveals himself and reveals the fact that Shintani had lied to him earlier when he asked about Yuuki's death. Shintani attempts to escape before Renoir can put her in a painting, however she becomes trapped when she gets to the stairwell. While she is on the stairs, Renoir traps Shintani in M.C. Escher's Ascending and Descending. Michiru Sakurada's only friend, Tomoko Okada, suddenly passes away while on vacation at a hot springs. Michiru falls into a depression and eventually becomes desperate to find a way to revive her friend. She studies several occult grimoires until she finds a revival method that was feasible for her. Michiru manages to successfully summon a demon and asks them how to revive Tomoko. The demon promises to give Michiru the power to revive Tomoko in exchange for Michiru's greetings; in agreeing to the contract, Michiru can never greet anyone ever again. Michiru accepts the terms and follows the demon's instructions for reviving her friend, including burning the notebooks that she and Tomoko made together that served as one of Michiru's most prized possessions. Michiru manages to bring Tomoko's soul to the real world but is shocked when Tomoko rebukes Michiru and tells her that she never liked her. Since Tomoko rejected the opportunity to be revived, the demon nullifies Michiru's contract. Michiru decides that she will stop isolating herself from her classmates and instead make an active effort to make new friends. After Michiru leaves, Tomoko reveals to the demon that she had rejected the offer because she didn't want Michiru to be taken advantage of by a demon's contract. In truth, Tomoko genuinely cherishes Michiru's friendship but believes that Michiru will be happy if she makes new friends and isn't beholden to a demon. "Thistle for Vengeance" continues the earlier story "Utopia." Yukari Sakaki continues her battle against bullying and repeatedly attempts to save Masaaki Yoshikawa from a group of bullies. However, Masaaki rejects Yukari's help as he refuses to see himself as the victim of bullying. However, the bullying continues until Masaaki considers suicide while on the school rooftop. Higanbana appears and encourages him to jump though she is stopped by Marie Moriya. Marie attempts to tell Masaaki that there is reason to continue living, however Masaaki takes Marie's encouragement as validation for his inner rage. He decides that, instead of committing suicide, he will take is revenge on his bullies. While walking home, he comes across a field of Japanese thistles. He recalls a school mystery he had heard before: while walking home from school one may find a field of Japanese thistles. In this field, there is one thistle that only bullied children can see. If they consume the flower, they will gain an intimidating personality and become bullies themselves. Just in line with the legend, Masaaki is offered a thistle by the youkai Azami. He eats the flower and, the next day, starts bullying others in his class. Originally he only bullies those who first bullied him, thus many people, including Yukari, see his bullying as somewhat acceptable since it can be seen as karmic revenge. However, Masaaki soon after begins to bully others in the classroom, causing Yukari to intervene. Yukari attempts to get Masaaki to see that he's just being a bully but he continues to believe that he is the victim overall. Masaaki vows to begin bullying Yukari the next day, however he doesn't get the opportunity as, while bullying a different classmate, Masaaki accidentally causes the kid to fall from the rooftop. The kid's accident causes the rest of the class to turn on Masaaki. The entire class begins to relentlessly bully Masaaki and continues to believe themselves to be in the right since Masaaki bullied them first. Sumire reveals herself to be working with Azami and is encouraging bullying within the class in order to get back at Yukari for insulting her earlier. Yukari decides that, in order to stop the cycle of bullying, she will have to become the victim of bullying again. She asks Sumire to use her powers to force the class to target Yukari instead of Masaaki. Sumire agrees and Yukari manages to endure the bullying with increasing difficulty. After ten days, Masaaki can't bear to continue seeing Yukari be bullied and asks Azami to give Yukari a flower to turn her into a bully. Yukari begrudgingly accepts the flower and, the next day, arrives at school with a profoundly changed demeanor. She declares that she will attack anyone who bullies anyone else. Yukari channels her urge to bully in order to keep the class under control and effectively eliminates any bullying. Long before the events of the previous stories in Higanbana no Saku Yoru ni, the youkai Higanbana comes to life in the form of a Western-style doll in the school infirmary. The school is overrun with countless youkai all battling for power. Higanbana defeats several other youkai in order to survive but otherwise finds she has no purpose. After some time, she sees Shuuichi Arimori being bullied by a group of boys. After the bullies leave, Shuuichi begins to draw in his sketchbook. Higanbana asks him what he's doing and he says he is drawing his emotions. Shuuichi tells Higanbana that he can see the world in ways others can't and can actually see his emotions. He believes it is his calling in life to draw his emotions so that he can share them with the world. Higanbana is fascinated by the concept of emotions and regularly meets Shuuichi to talk. Sumire empowers the boys who are bullying Shuuichi and the bullying escalates until Shuuichi is hospitalized. Higanbana visits Shuuichi in the hospital and learns that Shuuichi had been blinded by the attack. Since he is blind, Shuuichi can no longer see his emotions and lost his connection to the spirit world and thus cannot hear Higanbana anymore. Furthermore, Shuuichi's sketchbooks had been thrown in an incinerator by the bullies, thus Shuuichi seems to have lost everything. Higanbana thanks Shuuichi for teaching her about emotions and returns to the school. She lures the bullies who injured Shuuichi into the infirmary and strings them up like puppets. She forces them to dance until they tire, at which point they have their throats ripped out. Years later, Shuuichi returns to the school, being given a tour by Takeshi Nonomiya. Shuuichi has become a successful pianist as his ability to sense emotion wasn't limited to just his vision: he could hear his emotions as well. Thus Shuuichi continued his calling by turning his emotions into music. He briefly looks in Higanbana's direction and smiles before continuing his tour. 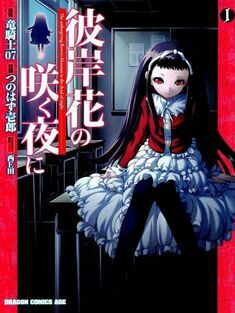 Higanbana no Saku Yoru ni's origin dates back to 2006 when Ryukishi07 started writing a serial light novel titled Gakkō Yōkai Kikō: Dai-hachi Kaidan Boshūchū (学校妖怪紀行 第八怪談募集中, lit. School Yōkai Travelogue: Recruiting the Eighth Kaidan? ), with illustrations by Nishieda. The novel first appeared in the third volume of Fujimi Shobo's Dragon Age Pure magazine on November 29, 2006. Two more chapters were serialized in Dragon Age Pure before it was discontinued: chapter two in volume four sold on April 20, 2007 and chapter three in volume five sold on June 20, 2007. The novel was adapted into a manga illustrated by Rei Izumi titled Gakkō Yōkai Kikō: Yō (学校妖怪紀行 ～枼～?). A short preview of the manga appeared in the fifth volume of Dragon Age Pure, and was discontinued after the first chapter appeared in the sixth volume of Dragon Age Pure on August 20, 2007. Higanbana no Saku Yoru ni then began as a manga written by Ryukishi07 of 07th Expansion and illustrated by Ichirō Tsunohazu. The character designs were originally designed by Nishieda. The manga was serialized between the May 2010 and November 2012 issues of Fujimi Shobo's Monthly Dragon Age magazine. Six tankōbon volumes were released between November 9, 2010 and February 9, 2013. A light novel written by Ryukishi07 with illustrations by Tsuitachi Sakuya titled Higanbana no Saku Yoru ni was published by Fujimi Shobo on December 20, 2011. 07th Expansion later produced two dōjin visual novels based on the manga. The first game, titled Higanbana no Saku Yoru ni: Dai-ichi Yoru (彼岸花の咲く夜に 第一夜?, lit. On the Night the Red Spider Lily Blooms: First Night), was released on August 13, 2011 at Comiket 80. The second game, subtitled Dai-ni Yoru (第二夜?, lit. Second Night), was released on December 31, 2011 at Comiket 81. Unlike 07th Expansion's previous game series Higurashi no Naku Koro ni and Umineko no Naku Koro ni, both Higanbana games contain seven novellas and are about the same length as an Umineko game. The games were also distributed by MangaGamer since February 7, 2014 for explicit use of the English translation patch, but following the end of the deal between MangaGamer and 07th Expansion, they have ceased to sell the games. "The Boy's Portrait" mentions replicas of several real paintings as being in the art room including Saturn Devouring His Son, Guernica, The Four Stages of Cruelty, Ascending and Descending, and Child with a Whip. ↑ 学校の怪談を題材にした竜騎士07の完全オリジナル小説!! [Ryukishi07's Completely Original Novel with School Ghost Stories as the Theme!!] (in Japanese). Fujimi Shobo. December 8, 2006. Archived from the original on September 14, 2011. Retrieved July 5, 2011. ↑ ｢学校妖怪紀行｣コミック版がいよいよスタート!! [The Comic Edition of Gakkō Yōkai Kikō Finally Starts!!] (in Japanese). Fujimi Shobo. July 4, 2007. Archived from the original on September 14, 2011. Retrieved July 5, 2011. ↑ "Higurashi Creator Starts Higanbana no Saku Yoru ni Manga". Anime News Network. March 9, 2010. Retrieved July 5, 2011. ↑ 彼岸花の咲く夜に 1 [Higanbana no Saku Yoru ni 1] (in Japanese). Kadokawa Shoten. Retrieved July 5, 2011. ↑ 彼岸花の咲く夜に 6 [Higanbana no Saku Yoru ni 6] (in Japanese). Kadokawa Shoten. Retrieved March 8, 2014. ↑ 彼岸花の咲く夜に [Higanbana no Saku Yoru ni] (in Japanese). Kadokawa Shoten. Retrieved December 28, 2011. ↑ Ryukishi07 (April 1, 2011). "HPが新しくなりました" [HP Gets Updated] (in Japanese). 07th Expansion. Archived from the original on July 5, 2011. Retrieved July 5, 2011. "Higanbana no Saku Yoru ni". The Visual Novel Database. This page was last edited on 3 April 2019, at 15:22.